EbixBenergy is focused on delivering a better benefits experience for employers, employees, and brokers through our comprehensive portfolio of innovative technology solutions. EbixBenergy solutions are trusted by hundreds of brokers, thousands of employers, and millions of employees across the United States. 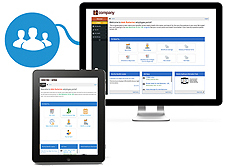 Integrated with the EbixBenergy Communications platform, employers can manage open enrollment and ongoing life event changes electronically, while giving employees 24/7 online access to the information they need to make informed benefits decisions quickly and easily. Employees can review plan details, side-by-side plan comparisons, and dynamic plan tours. And they can enroll using an intuitive, multi-step process. Upon completion of the enrollment process, employees will receive confirmation statements showing the plans they enrolled in, along with the associated costs.